World class mountain biking is on our door step! From novice to expert , whether cross country, enduro or downhill, we have it all. We also have a 2km trail through the woods of Dukes Barn , with jumps and single track to keep you entertained! We can arrange mountain bike hire, but prefer guests to bring their own bikes and Andy will be delighted to share his local knowledge with you. all about 40 minutes away. 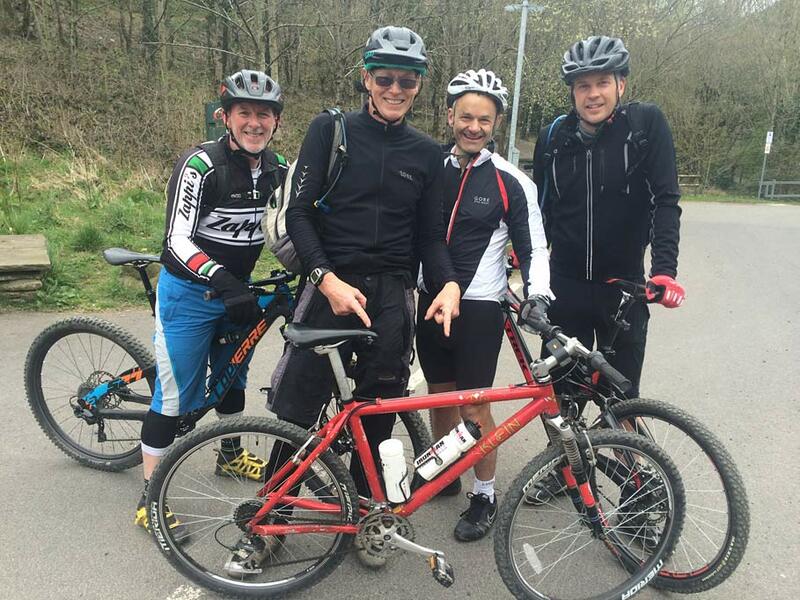 Natural riding trails in the Black Mountains and Brecon Beacons National Park are numerous from short gentle rides along the canal to major 60km plus loops on bridleways and trails.. Some rides are accessible directly from the Barn, whilst others need about a 30 minute drive. Andy rides these trails regularly and can advise on terrain and help you select a ride. We have over 20 rides to choose from in this area. The valleys of South Wales, Wye Valley, Forest of Dean and the Gower Peninsula also offer a multitude of mountain bike rides within a short distance, again with over 20 rides to choose from. Circuits taking in Sugar Loaf and Blorange - the two peaks rising above Abergavenny and offering superb, single-track riding, big climbs and stupendous descents. A circuit of the Black Mountains starting near Crickhowell - over 1200 meters of ascent, a 40km circuit including the highest point Waun Fach, with a 13km descent ! Offering fast flowing single track trails and fine views in a mountain environment. A circuit of the Brecon Beacons taking in the high mountain pass through the Brecon Beacons west of Talybont, 600 meters of ascent over a 30km circuit. Abergavenny and a circuit of Blorenge. One of our local rides using a discarded railwayline, forest and moorland. Spectacular views from the summit of Blorenge and superb single track 22 Km and 600 meters of ascent. A ride along the Brecon to Pontypool canal , no hills ! Pubs , cafes and taking you into the heart of the National Park. Up to 30km with options for much shorter circuits and negligible height gain. Where can I hire a performance mountain bike/regular mountain bike? How far away are the MTB trail centres? Tell me more about Bike Park Wales? What about easy off-road trail centres? What are the riding options during the winter months? Are there any bike shops nearby? What MTB events take place in the area? What guiding do you offer? Where can I hire a performance mountain bike / regular mountain bike? Most of the mountain bike trail centres hire bikes appropriate for their trails and are best hired at the venue . We can advise on suitability and logistics for pick up. Forest of Dean, Cwm Carn and Bike Park Wales are no more than a 40 minute drive , whilst Afon Argoed is about 1 hour away. Located near Merthyr Tydfil , it offers all grades of descents ( blue, red and black) so for novice to expert. Predominately down-hill riding, with a vehicle uplift service, and a first class cafe , shop and service station. The uplift service can be pre booked on line , but is popular so book well in advance. Day uplift passes are available on the day but may necessitate a slightly longer wait for the uplift. For the red and black runs, basic body armour and an appropriate cycle helmet is advised. What about easy off road trail centres? Forest of Dean off road centre has easy flat circuits , along with excellent intermediate blue and rcross country circuits and dedicated down-hill descents requiring body armour. The mountain bike trail centres are rideable throughout the winter and have cafe ,shop and hire facilities operating throughout. Depending on weather conditions we can advise on the most favourable centre. We also ride the natural trails through all seasons but local knowledge is advisable to pick an appropriate route depending on weather and trail conditions. We have had some of our best riding in the winter months, so don't let this put you off , especially with the prospect of returning to a warm fire and steam room! Dukes Barn is 5 miles from Abergavenny. There is a train station at Abergavenny and a good taxi rank. For mountain biking A six mile, hilly, road ride gets you into the mountains where the off road begins . So we often ride directly from the Barn . 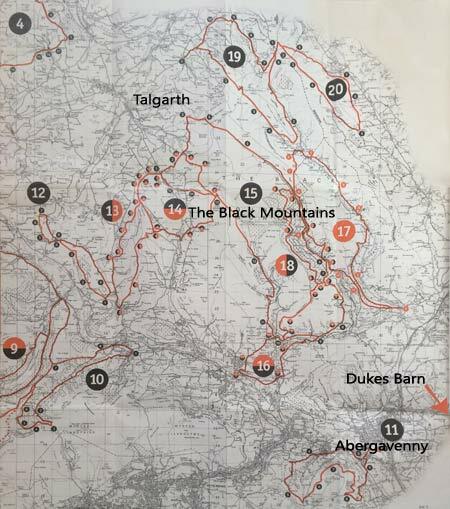 However a 20 to 40 minute drive accesses the main rides in the Black Mountains and Brecon Beacons often cumulating in a good pub or cafe finish. So we recommend bringing a car if you are serious about maximising your riding. We can arrange transportation with prior knowledge and guiding if required. Gateway cycles ( http://www.gatewaycycles.co.uk ) in Abergavenny is a well stocked shop offering bike repairs and spares. And the mountain bike trail centres at Forest of Dean, Cwn Carn, Bike Park Wales and Afon Argoed all have dedicated mountain bike shops and repair facilities. What MTB events take place close by? Cross country, enduro and downhill events take place at the trail centres and the Welsh hills most weekends . So if you are keen to combine your stay with an event then have a chat with us to secure a place and we can advise on logistics. Andy is happy to offer informal guiding and show you the trails . However he is not offering formal guiding and you ride your bike and select the trail at your own risk !